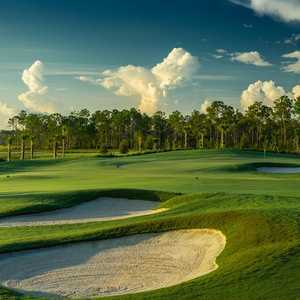 NAPLES, Fla. -- Arrowhead Golf Club is in a highly affluent economic climate where the price to play and the quality of the experience make for one of the better deals around. A full-service public facility, Arrowhead is a popular venue for outings as well as special leagues and junior programs. There are 17 ponds on Arrowhead Golf Club. Arrowhead Golf Club in Naples offers a challenging championship course that is easily accessible from Ft. Myers, Bonita Springs, and downtown Naples. 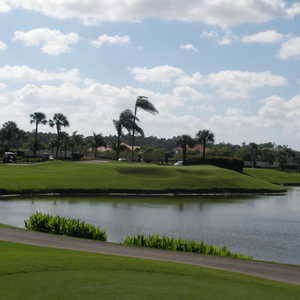 The course winds through 16 sparkling lakes. Although water is a prominent presence, the hazards are often only along the perimeter. "The service and friendly atmosphere, affordable prices and good course conditioning are what brings people here again and again," said PGA Professional Dan O'Neill. "We have a lot of repeat business." Thus it's no surprise Arrowhead has been Voted Best Public Golf Course in southwest Florida for several years by readers of the Naples Daily News. O'Neill admitted that two years ago, this well used public track suffered from maintenance issues. No longer. Arrowhead, owned by a private group of investors and managed by Coral Hospitality, brought in a new course superintendent and crew and buckled down to upgrade the course and facility. "It's really in great shape," O'Neill said. "Today you wouldn't even recognize it." 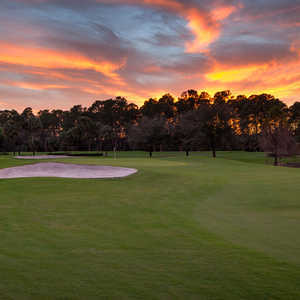 Designed by Gordon G. Lewis (1998), a highly respected architect especially known in Florida for creating solid playable courses, Arrowhead plays 6,832 yards from the tips (4,711 yards from the forwards) over a modestly rolling terrain. Arrowhead is a pretty course as well as a Certified Audubon Cooperative Sanctuary. Although there are 17 lakes or ponds on the course, water doesn't really play too big a part in your game unless you fly way off track. With few forced carries, the longest stretch over water comes on your second shot on no. 7, yet it's just 130 yards. Some tees are elevated, but most greens can be approached by bump and run shots, and with five tee boxes, golfers will have plenty of choices. You start out with the no. 1 handicap hole -- a 596-yard par 5. One of the more interesting holes, no. 9 with a lake running all the way up along the left side is also a favorite of O'Neill's. With the clubhouse straight ahead, it's a fun hole to play. "From the back, hole 15 is an unbelievable par 3 playing 243 yards," O'Neill said. Still, it's user friendly from the forwards playing just 86 yards. Arrowhead offers a number of programs to encourage enjoyable play. For example, the club subscribes to the Tee It Forward program and offers PGA of America's five-session "Get Golf Ready" program to help new golfers get into the game. To help build its base of new golfers, Arrowhead runs a Thursday evening golf social league for men and women. You can sign up as a single or bring a friend. The price includes nine holes, cart and a drink. Summer memberships are also affordable, giving full golfing privileges to singles and families. After your round, the Pub is a friendly watering hole serving staples -- burgers, fries, wings, wraps, salads and Paninis, such as the "Margherita" made with mozzarella, tomatoes and pesto on Focaccia. Whether you're a Naples resident or a visitor coming to play a few rounds, one of the great plays for the price is Arrowhead Golf Club. For those who just want to practice, the facility features grass tees where you're hitting to targets set in a large pond. There is also a nine-hole practice green. This course is a great choice for singles as well as buddies who want to have fun yet be challenged playing a well groomed course.